Picking horizons across different surveys is easy in DUG-Insight. There's no need to create separate horizons for each 3D and 2D survey. Insight works with a single horizon containing sets of picks located according to the data they are picked from. After completing the interpretation work, use regridding to translate the interpretation to general UTM X/Y coordinates or a specific survey. In this map view, we have a 3D survey covering a small area, with an intersecting regional 2D survey extending into an area of interest. We would like to use the picked 3D horizon as a guide for the 2D. 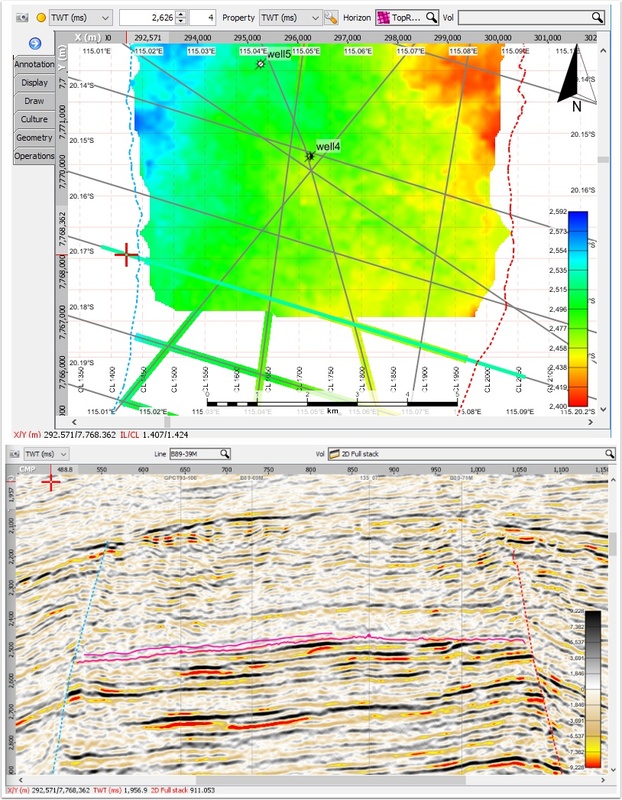 In the 2D line view, we can see the intersection of the 3D horizon (pink line) with the 2D full stack seismic. We can use the 3d picks as a guide to pick the same horizon on the 2D lines. We now have a multi-survey horizon picked on both 2D and 3D data. We can view this horizon in the Map View. In this example, the 2d picks overlap the picked 3d region. It's clear that there is a time shift between the surveys. 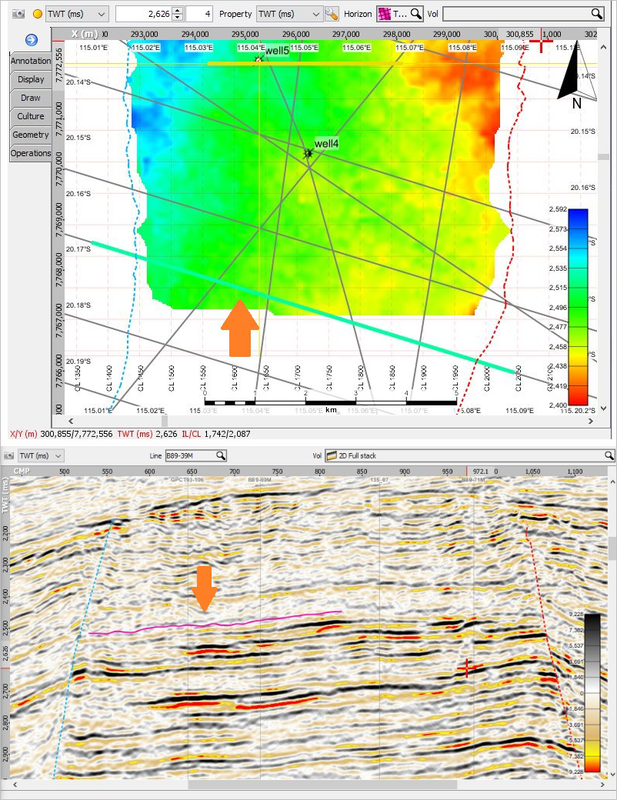 It looks like the interpreter should have tied the 2D and 3D seismic by applying mistie correction to the 2D lines before working through the interpretation! Where the 2D and 3D picks overlap, DUG-Insight shows two interpretations on the same horizon. To resolve this use the Regrid tool to translate the multi-survey cleanly onto one survey or XY space. The tool allows you to specify the priority of the surveys when resolving these overlapping picks.